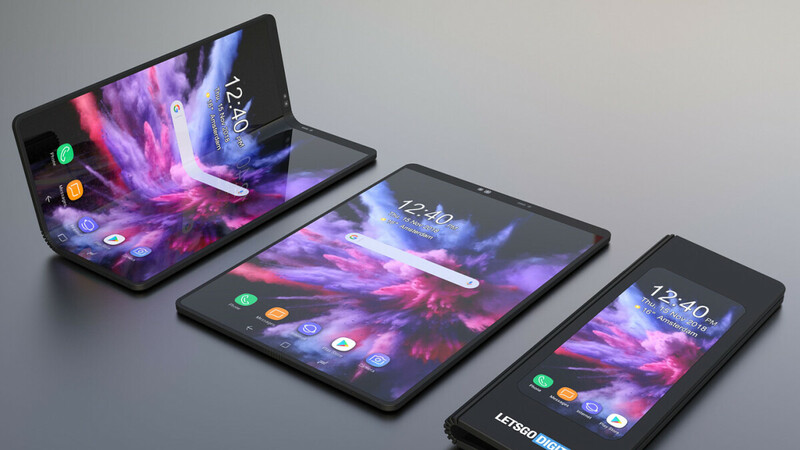 Samsung will allegedly be offering a glimpse of its foldable phone tomorrow, during a Samsung Developer Day conference that will take place in Seoul and will become an annual occurrence. Why annual? Well, Samsung's mobile chief DJ Koh recently shed some light on the company's future plans and said that the department's fate next year will be much better than this one's, buoyed by the Galaxy S10 trio and the foldable Galaxy F-series or whatever it gets called. The F-series is apparently here to stay, too, as DJ Koh had said that Samsung will have a new foldable model each year from now on, and has even patented the possible designs of such phones right about the type it let us take a first glimpse of the device's prototype during its dev expo in San Francisco. The patented designs, found by LetsGoDigital, feature in-folding models with exterior displays that can occupy the whole front or only half of it when the devices are closed. They could also apparently be split in two themselves, or slope towards one of the phone's edges, transitioning seamlessly into the larger internal display. As to what should the "Hologram device" and "Projector" entries in the foldable phone schematics below mean, it's anyone's guess at the moment. They will continue to refine the design. 1.0 is probably gonna be a bit boxie in style. But in a couple years its gonna be a very thin compact design. I think with one side being like Note, with a very thin flip cover like top that opens like their S-View covers. Slim the battery and use a very flat small PCB, and it could turn into a very nice device, thst could be mass produced quickly, bring the price down to the masses. In 2 years it will be available for under $700 and its gonna be what the Note was. Something everyone thought would be a failure and now everyone has followed. Best ever. aerospace grade. surgical precision. state of the art. Liquid retina display. Pls. spaceX do you job fast I want to leave this planet. If this has the note features and the Spen works with it i will definitely be interested in it. I'm really excited for this series. Can't wait to get my hands on one. Day One purchase.